Yesterday (Saturday) - we were without Ian, who was unwell, but this gave us the chance to dust off my old Wild West rules and figures! - they were last out in 2009! The scenario was a few brave men attempting to save a town from a rampaging force of Apaches in New Mexico, the townsfolk having mostly fled to the hills! 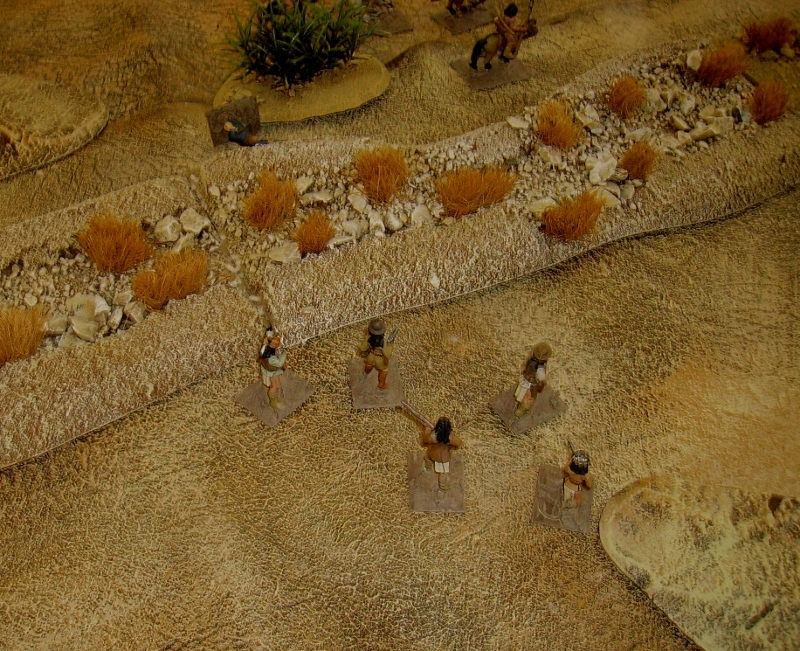 My men, Frenchie, in blue, Chico, my Mexican amigo, and myself, Rickie, set up along a dried river bed and awaited the expected Apache warband. Gareth, who had chosen a warlike, but not too bright character waited near the Cemetery. His sidekicks, the bank manager and a clerk, protected their workplace! Lawrence waited on a rise at the end of the main street, with his sidekicks, Forbes and Mitch. Unseen, the first of the Apaches approached. A small mounted contingent joined them. Another group headed for the dry river. The Apaches approached the town, where Lawrences' men were waiting. Gareth, failing his Initiative roll, decided to stay at the far end of town! The Bank staff decided to walk down the street towards Lawrence. My men got a fleeting view of the Apache cavalry, and stood ready. The Apaches began to group for their attack on the town. One group decided to infiltrate in via the dried river bed. The cavalry, with some foot braves, approached using cover to hide their approach. Lawrence, seeing an approaching group, hid from view and allowed the Indians to come closer before opening fire. Joined by the bank staff, Lawrences men let rip! One Apache fell dead with a head shot from Forbes, two others were grazed. The Apaches retreated to cover, firing. The band which went back to the hill, were exposed, and 2 were quickly wounded, deciding to withdraw from the battle. Lawrence ordered the bank staff back to town, and continued shooting. On my side of town, the Apaches spotted me and opened fire. Our return fire only wounded a horse, but Frenchie slumped back dead. The Apache cavalry raced forward to outflank my position. Their supporting troops pushed forward confidently in support. The cavalry reached the river bed...but I had fallen back to town! Safe, we celebrated our escape! Gareth had finally got himself moving, and entered the shop next to the one where I was hiding! His sidekicks stayed in a shop doorway across the street. The Apaches facing Lawrence were still trying to hold their ground. Another shot from Forbes killed another Apache! The Apaches facing me ignored Frenchie's body and tried to hook round the town. Unseen by Lawrence, another group of Apaches were still moving down the riverbed, and threatened to outflank his position. Lawrence finally killed the last Apache on the hill. Despite Forbes killing another Apache, the other group facing Lawrence were still holding on. Fortunately, Lawrences men took no casualties aside from a few grazing hits. The bank manager moved forward again to watch the action. Back on my side, the Apaches decided to attack the town. Gareth decided to go out of the Jailhouse door to face the Apaches alone, he had called the bank manager and the clerk into the cells! Unfortunately, the blast from Gareth's scatter-gun went wide, and the Apache cavalry rushed him! ...they didn't need any, Gareth slumped to the ground bleeding heavily from a lance thrust in his left thigh. As the whooping cavalry moved round the house, their supports saw Lawrences men and shot at them, despite the long range, their shooting was deadly. Forbes was hit in the head and chest, he fell stone dead. With the appearance of this force on his flank, Lawrence gathered all the remaining men and high-tailed out of town. Chico and I had not interfered when Gareth was killed, as we would have been killed too, so we too decided to leave the town to the Apaches! Fortunately- they seemed to be more interested in liquor than chasing us! The battle was very tough! - I think the poor sidekicks Gareth and I rolled up didn't help, but next time, we will probably use a few less Apaches! Advanced solo rules for X-Wing, our first game. We did a game with all 3 players taking an X-Wing, and the solo system(s) running the Ties. As Gareth is not, as yet, a gifted pilot, he opted for the Luke Skywalker pilot option, with R2D2 to repair his shields! Ian and I (Lawrence is unwell and Phil is working) took standard Red squadron pilots. The solo forces were 4 Black squadron Tie fighters, and a Tie interceptor with determination, which matched the points off! At this distance, they all chose a 5 straight manoeuvre. We had one ship using the original solo rules, the Tie interceptor and the other 3 Ties using the new advanced rules, with the new 12 angle template. The Ties pushed on in formation, they would only react if they came within 24" of us or 12" of the table edge. ...before breaking and attacking targets of opportunity. With a couple of deft manoeuvres, we got into line. 1 of the Ties started banking to face us, the rest continued on! Our next move was countered aggressively as the whole formation broke and attacked! We got a hit on the interceptor, it blew both of my shields off! The dogfight rapidly broke up into 1:1 combats. The Tie interceptor moved out of the combat while the Ties meleed. Gareth turned and rapidly got a Tie on his tail. The interceptor Koiogran turned to re-enter the fight. Ian and I turned after individual targets. Gareth Koiogran turned to face his pursuer, while I attacked his pursuer from the flank. The Tie interceptor raced in to attack me..Ian tackled 3 Ties alone! Ian pushed through the Ties and tried to attack the interceptor, Gareth moved to help him, and I turned after Gareth..sorry...Luke! The other Ties Koiogran turned or weaved to help their leader. Luke got his shields shot off by a Tie...good job R2D2 was on board! Ian Koiogran turned and hit the interceptor with a Direct Hit! - Kaboom! Ian banked left, allowing Luke to catch up, shooting and damaging a Tie on the way. As a wedge they attacked another Tie as his companions tried to turn on us. Ian managed to get a lock on another Tie and killed it. I was fighting the other 2 Ties..
Ian and 'Luke' turned to engage another Tie..I had banked onto the tail of a tie attacking the other X-Wings. Luke lost another shield as their Tie Koiogran turned on them. My Tie Koiogranned too, but I hit and destroyed him. 'Luke' got a killing hit on their Tie too. I engaged the last Tie, but we matched manoeuvres and could not get a shot at each other. Engaged with me as we both Koiogran turned next to each other, Ian and Gareth raced in..
..and blew the last Tie out of orbit! Ian and I had 1 hull point left each..Gareth (Luke) escaped undamaged, as R2D2 had repaired his shields..and he had been able to do the required green manoeuvres! So..despite the misgivings of my 2 subordinates half way through the game when we hardly hit anything, we managed a clean sweep! So how did the rules do? The first thing we noticed, was after the first couple of turns, the Empire having initiative meant that we did not need to use the Ties manoeuvre dials - we just diced their move and action and did them immediately! The advanced system did play more aggressively than the basic system, and did some interesting things, like Koiogran turning on a nose to nose approach so they ended up behind the X-Wing. Fortunately, both times the system did this, so did we! For an equal points game, the solo system gave a very close game, and Ian or I could have been killed quite easily but for some great dice rolling towards the end of the contest! I wonder if giving the solo system a few extra points would make them too hard to beat next time?? Hope you enjoyed reading about it!